The “supermoon” will move between the sun and the Earth on Friday in an event that will darken the skies above Northern Europe. According to astronomers, this type of eclipse is so rare it will occur only three times more this century. 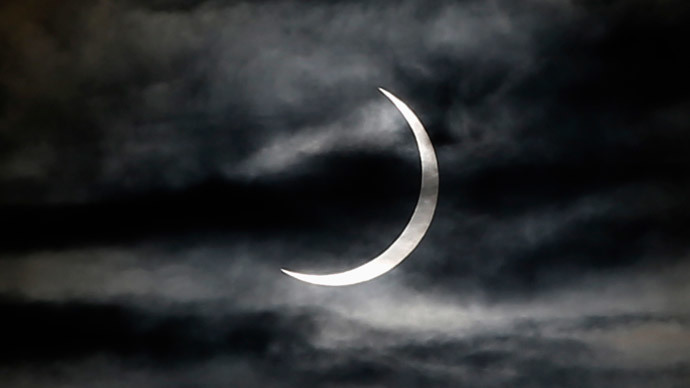 A solar eclipse is to take place in the morning on March 20, but only a small part of the world will get the experience of a “totality”, or full eclipse, with a partial few-hour-long eclipse in store for residents of Europe, North Africa and West Asia. Its path will start in Greenland and move across the North Atlantic and Arctic Oceans mostly. The moon’s position is currently at its closest to the Earth – this is usually dubbed “supermoon”. It is believed that this will make the eclipse particularly jaw-dropping in the Faroe Islands and in Norway’s Svalbard archipelago, where the occlusion of the sun will reach nearly 100 percent. The rest of the Norwegians and the Scots will be lucky enough to eyewitness around a 90 to 95 percent occlusion, while in the south of the UK, an 85 percent occlusion (approximately) will be best observed at 09.30am GMT. In Paris and Berlin the best time to lift your eyes to the skies will be at 10.30am local time. However, it is better not to look directly at the sun – even wearing dark sunglasses – as you run the risk of permanent eye damage. So, sky gazers are advised to make a basic pinhole projector, and face away from the sun, or to wear eclipse glasses. An online broadcast of the celestial event could be watched via the Slooh Community Observatory’s website (slooh.com) starting at 08.30 am GMT. Moscow residents will be able to enjoy a special live stream in the center of the city, and in the underground as well, from 7:00pm until midnight local time. Hundreds of astronomers have already gathered on Svalbard, where the sun will be completely obscured. The rare phenomenon will provide them with a unique opportunity to study the corona, or the atmosphere of the sun. Its temperature still remains a mystery, as it is approximately twice as hot as the sun’s surface. The remote Arctic archipelago has had some of its hotels booked out since year 2008 as Svalbard is renowned for being incredibly scenic on this particular day. So, some of the observers are having to stay in tents, running the risk of a surprise rendezvous with polar bears which are known to roam around around. A Czech tourist, Jakub Moravec, who came to the place in anticipation of the eclipse, suffered minor injuries after a polar bear attacked the tent he was sleeping in, Norwegian authorities said on Thursday, according to AP. This Friday is also remarkable on account of the fact that it is the date of a spring equinox, when night and day are of equal length. The unique coincidence of a total solar eclipse, a supermoon and a spring equinox is regarded by some Christians as a sign of the beginning of the end of the world.